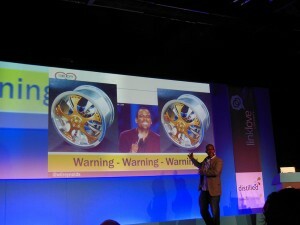 #LinkLove kicks off in a new venue this year and the first speak to take to the stage was Wil Reynolds. Wil’s presentations are always interactive and interesting and this morning’s did not disappoint. Wil Reynolds spoke about “Head Smackingly Simple: Post Conversion Link Building Tips”. He started the presentation asking us “What if getting the link was not the finish line?” Wil said that getting the links is the start of something bigger, don’t just be happy by getting that one link. He demonstrated his point by going through a lot of case studies to show how getting the link is not the end of the story. If the concept of building links was a stair stepper then what would you do? When Wil went on holiday to South America, helping supply fresh water to the community. He wrote a out of office assistant and said he will be working to provide fresh water and supplied the website URL for donations. He received an email from someone who had contacted him that week he was away and that person also donated $1,000. Result: Money raised for the charity – not just a link. A prospective employee sent a resume to SEER looking for work. Instead of just emailing this person back and saying “Thank you for your cv, we will get back to you”, Wil has decided to make a video about with the current employees about working at SEER. Everyone wants to bring in new business, it can be difficult to win new clients. SEER is promoting a video about how they are excited about working with different people/businesses. If a company is looking to work with a new partner, they will see videos such as this as trust signals and will be more inclined to work with them. The @mention is a nudge and should not be underestimated. Wil buys books for SEER employees and put them in the office, takes photos of them and tweets the photos. SEER tell visitors that people can come into the SEER office and take that book – for free. This is all from using “@” on Twitter. Another example Wil gave was when he tweeted about the new Philadelphia to Boston route offered by JetBlue. Wil was excited about it and tweeted @JetBlue which then was responded by them and they offered him to fly with JetBlue. There was not a link…. yet. The day after Christmas last year, Wil tweeted an old post about Rackspace. Wil really likes Rackspace as they are very reliable and always help him if a site/infographic goes down. Rackspace say the tweet, emailed Wil back and asked him to write a guest post on the Rackspace blog. Who doesn’t want a link back from Rackspace? At SEER, they encourage employees to write about news in search, tools they like and they share these posts with others. Google asked SEER if they could link from their Adwords link to their blog because they see that SEER share news with others. The traditional booths at conferences are very salesy. Wil is not a fan of boots and sponsors. They are all want to promote themselves. It is very expensive to have a booth at SMX. However, @GaryVee set up a booth to help people, not to sell his products. Wil is going to do this, will get a booth in August to build real company sh*t. He is not doing it for links, but to help people. Wil analysed many emails he sent where people asked for help. Wil used some analysis and realised that the more people you have helped, the more people will help you. Do you have newsletter with over 1,00 subscribers How do you know who write for blogs? Check out FullContact which is a third party site which enhance contacts with rich social profiles. Then you can really see who your subscribers are. Segment your list, can you target them differently. A company that sells climbing frames for children, Climbingframesuk.com, ask their customers to take a photo of when they have built the climbing frame for a chance to win a 100% refund. People want to take part in this and they are also visiting the site as it has all the user reviews. Drop a URL into ripples, when you do, you can see the bigger circles and the influencers who can push similar content. Use Google+ for ripples. Go to Twtrland and drop your name in. Make sure when you drop stuff in, then see how many times it has been retweeted. See who you have replied to the most. Please start doing these tips now, Wil have been sharing some fantastic advice for years, but people are not listening. Link Love is Revenue Love, take advantage of the nudges and start generating links which will lead to more traffic and sales for your business. It’s a nice article Jo. Actually Wil Reynolds always offers fun and informative presentations. 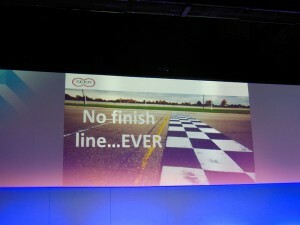 He got a lot of useful ideas on SEO and if you listen from his presentation you will surely get a lot of useful ideas.